The Spinter Cell: Conviction Collector's Edition is now going to be cheaper because of an unfortunate defect. Splinter Cell: Conviction's Collector's Edition, the one coming to North America anyway, was announced at a price point of $80, but Ubisoft recently informed GameSpot that the price would be reduced to $70. This isn't due to the state of the economy, or charity on Ubisoft's part, but rather a defect in one of the included items. The North American Conviction Collector's Edition will come in a steel case and includes an art book, comic book, decals, USB drive, and an in-game outfit and weapon. The item at the heart of the price reduction issue is the custom USB drive, which Ubisoft says a "random sampling" that it tested were found to be defective. The drive was supposed to come loaded with a bunch of extra features including wallpapers, concept art, "making of" videos, and storyboards. Ubisoft did not say what the issue was with the USB drives, but the company did say that not all of them are defective. So, if you purchase a Splinter Cell: Conviction Collector's Edition and receive a working USB drive, it's just like hitting the lottery! All of the extra features available on the USB drive will be available through a method to be revealed on Splinter Cell: Conviction's website on April 15. There are separate limited/collector's/special editions of Splinter Cell: Conviction available in other regions of the world and through specific retailers, which is why this issue only affects the North American release. 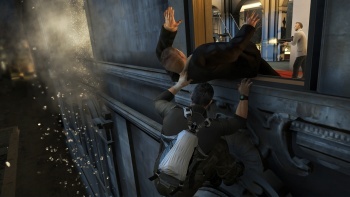 Splinter Cell: Conviction is scheduled to release for the Xbox 360 in North America next week on April 13. The PC version is expected a couple weeks later, and don't forget, it'll include that awesome new DRM!